review & completeEACH step of the registration process. a confirmation email from Bossed Events! STEP 1 Review class offerings and choose your session date. your email within 48hrs after completing payment, please reach out to us directly at our customer service number 469-708-2983 and be sure to leave a voicemail if we are unable to answer. We do require a separate registration form for each class, however you may pay for multiple classes at one time. You will be directed to our Cash App payment link upon submitting your registration. class, we will offer a ONE TIME CREDIT towards your next class of choice offered by Bossed Events! Love what you are doing, but having trouble figuring out how to monitize your skillset? 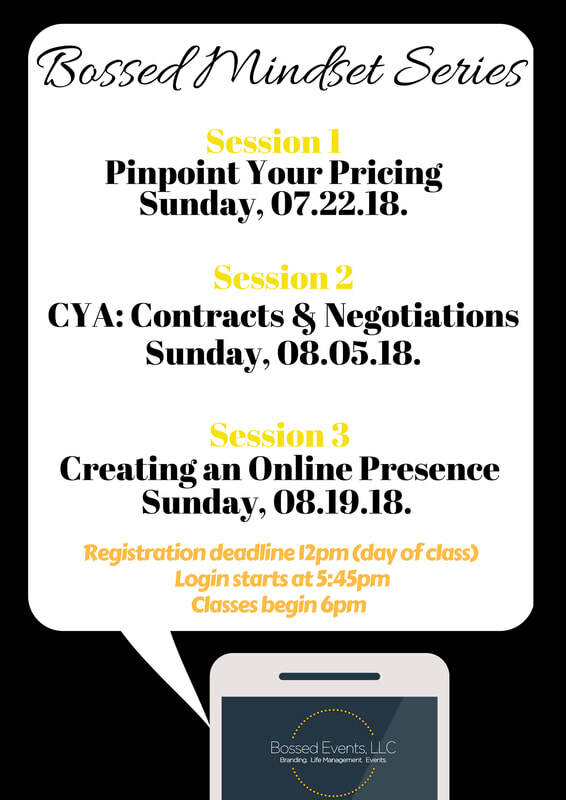 Join me on 7.22.18 as I offer tips and pointers on how to develop your pricing structure, and present it confidently to your potential customers. Learn the importance and value of having a standardized contract, the pitfalls of failing to obtain said contract, along with the art of contract presentation and negotiation. Don't think you need a website, blog, or social media profiles? Let me show you WH Y you are wrong and offer you tips on how to get started! Don't miss the sale! 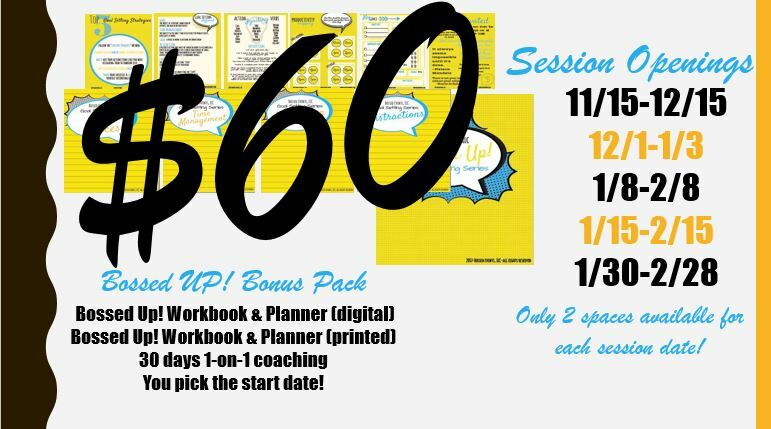 Get your workbook & planner and coaching sessions booked today! kick off in November 2018! homework and challenges sent straight to your inbox. and get your goals headed in the right direction ! Take your Goal Setting a level up! Need a little extra help? Register for one of our Level Up private sessions! 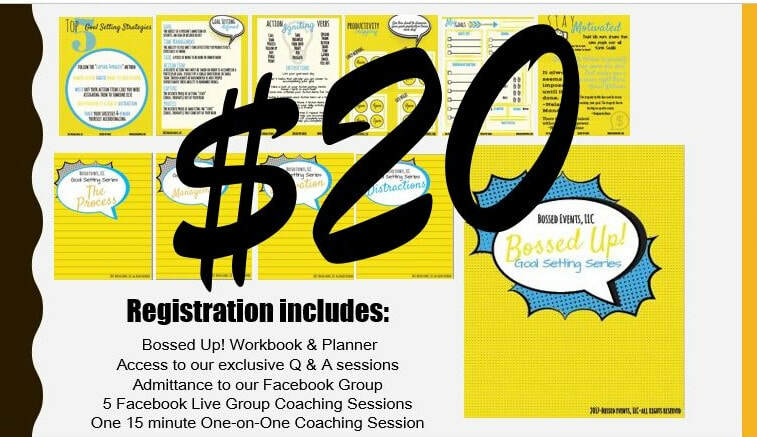 Includes access to all of our Facebook group content along with weekly one-on-one sessions, a printed workbook/planner, and 30 days chock full of accountability, motivation strategies & check ups to ensure your success!